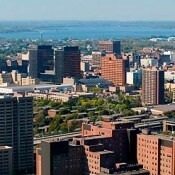 Syracuse – Best Place to Live?? Farmers Insurance has released their seventh annual list of the Most Secure U.S. Places To Live and Syracuse is ranked No. 3 for large metropolitan areas of 500,000 or more residents. Last year, Syracuse was 19th on the most secure cities list. The rankings, compiled by database experts at www.bestplaces.net, considers crime statistics, extreme weather, risk of natural disasters, housing depreciation, foreclosures, air quality, terrorist threats, environmental hazards, life expectancy and job loss numbers. The results are divided into three groups: large metropolitan areas, mid-size cities (150,000 to 500,000 residents) and small towns (less than 150,000 residents). Now for an real estate investor, it’s a great place to invest! For a variety of reasons, not to mention a weak dollar, this is actually a very unique time to invest in the US. Syracuse is a great place to start. As for Manhattan and the NYC area, cap rates are very low – it is almost impossible to find an investment property in NYC that will generate a positive cashflow. You CAN find a cashflowing property in Syracuse. It’s about time smooene wrote about this.